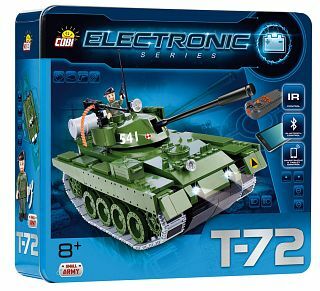 The set T-72 Tank from the Cobi Electronic series from Cobi S.A. consists of four hundred and fifty Cobi bricks, a detailed and comprehensive instruction, the controlling pilot and three figurines of soldiers. Following the instruction included in the package, you can build a radio controlled tank. It takes about three hours to build the tank. In the set you will find cables to be connected with the particular bricks. The tank colours are green and black. Once you have constructed the tank, you have to activate it and then you can manipulate it with the buttons of the pilot. The tank can move on a floor or a carpet, as well as move through obstacles or move another tank or other toy in front of it. It can turn, move back, go ahead and you can control its speed. Apart from that, you can turn on the front lights of the tank and adjust their range and then invade your enemies in the dark. 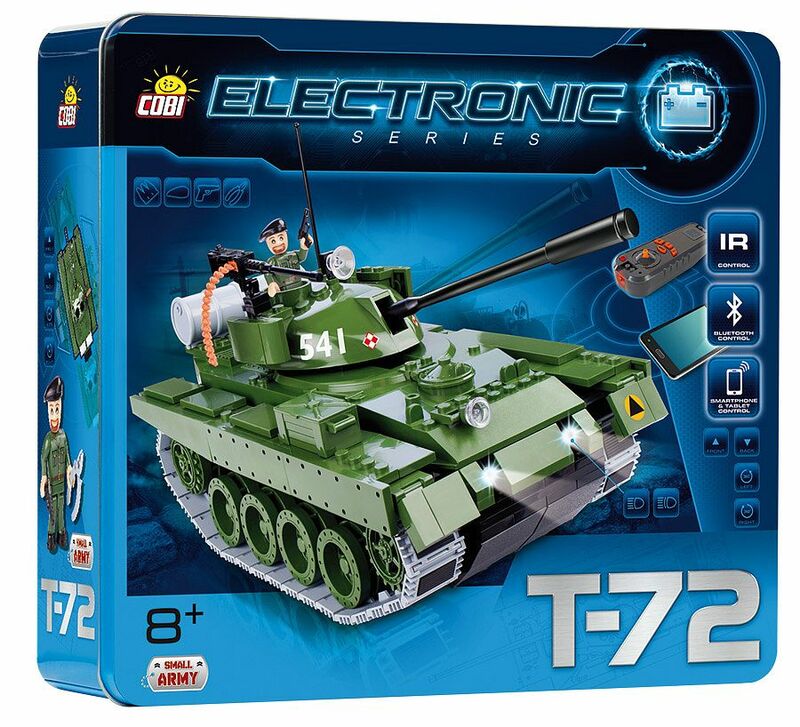 The set T-72 Tank from Cobi is an absolute attraction and a total novelty. Every collector of own army should have one; also those who are interested in radio controlled vehicles. Top quality leisure guaranteed! Bought this for Christmas for my son. We assembled it together. Some small parts where missing but luckily we found same parts from our LEGO parts so we managed to complete the assembly. My son was very unhappy. I have to wait for Christmas to end to return it to shop for warranty. I'm never going to buy Cobi again, go with LEGO, at least you will get quality. It seems that all COBI tanks have four wheels - whatever their type. The turret resembles a T 54 /T 55. What ever the case - the tank works with a reasonable speed and is therefore manouverable on a desk. The metal box is exceptionally worth to be mentioned. A pretty good and sturdy work made in Poland. uprzejmie informuję, że wszystkie informacje dotyczące tego zestawu ,znajdują się na stronie sklepu internetowego COBI.